Simultaneously evoking both the timeless appeal of classic luxury style and the ancient serenity of the African savanna, this 18k Yellow Gold Elephant Charm from Cartier possesses incredible richness and vibrance. 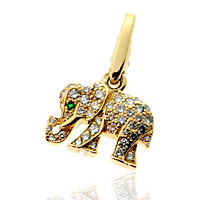 The "eye" of the Elephant is represented by a gorgeous lone Emerald, while numerous Round Brilliant Cut Diamonds serve to represent this majestic creature's glittering hide. 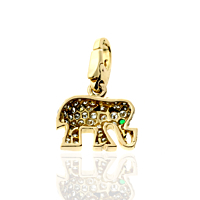 An imaginative and stylish addition to any Charm Bracelet or Charm Necklace!